C19th church in West Hampstead, incorporating a café, post office and double height children’s climbing apparatus in the nave and aisles. The altar is still used for religious services, so the gig was an intimate semicircle of chairs around a grand piano. 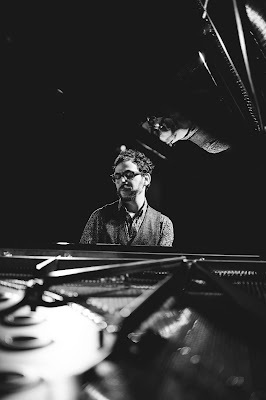 The organiser was Yehuda Inbar, a young Israeli concert pianist and doctoral student at the Royal Academy of Music, who decided to launch a programme of (mainly classical) concerts in the space. Evidently a persuasive man, he got Mark Padmore, the renowned classical tenor singer to launch the series with a fundraiser, played one concert himself and followed with this jazz piano performance from Omer Klein, because he knew him as a friend. It is Klein’s only scheduled UK date. The evening opened with a set from two RAM students – Alex Ridout (trumpet) who was BBC Young Jazz Musician of the Year 2016 and Noah Stoneman (piano) who was a finalist in the competition. They played Kenny Wheeler’s Everybody’s Song But My Own and one piece from each of them. They are part of the latest, extremely talented, generation playing in a recognisable tradition of British European jazz – polished, lyrical, tasteful and reflective – and, on this evidence, they are developing strongly. Omer Klein is something else entirely. Classically trained he started his jazz career in Israel strongly influenced by Jewish folk tunes and had a spell in the USA studying and playing, sometimes with Israeli jazz musicians. Now 35, he has settled in Germany (to the point where his Wikipedia entry is in German). He is now signed to Warner who have released his seventh (piano trio) album – Sleepwalkers – which provided most of the material for this solo set. Omer Klein comes from the school that treats the piano as a percussion instrument, with rhythms being as important as melody, especially for the left hand. With self-taught players and a background in folk and blues, that can mean the beat and the repetition overwhelms any harmonic subtlety. When it is married to a classical technique like his, you get the best of both rhythm and harmony. A lot of the time, Klein preferred to play broken chords to accentuate the rhythm. He used the full range of the keyboard with either hand, crossed or uncrossed. He hit thunderous left hand chords and double handed crescendos; he played sections with his right hand alone. Such virtuoso playing could become flashy or bombastic in the wrong hands but Klein does a nice line in self-deprecating, modest charm as well. And he can play with softness and restraint when the music demands. As you would expect from such a diverse musical education, Klein’s playing draws on many influences of which jazz is the biggest, but not the only one. The opening number Niggun drew on his Israeli roots while other tunes – Yemen, Chouia – had middle eastern or north African references and the encore was a song by Tom Jobim, the Brazilian. There were also classical echoes, including a passage that could have come from Terry Riley. But you can take the game of “Hunt the Reference” too far. The ballard Wonder And Awe reminded me of Anouar Brahem and Francois Couturier, but Klein said it reminded him of the theme from ET. He knows best. The circumstances made this an informal and relaxed occasion, and the absence of the rest of his trio probably made Klein take on more responsibility for the beat than he normally does, so it sounded slightly different from his recordings, but equally engrossing. If you missed the gig, two recommendations: Check out Omer Klein's Warner album Sleepwalkers and if you live within striking distance of West Hampstead, get on the Sherriff Centre mailing list. Some of the names may be unfamiliar, but the standard is set very high. I love this venue! Hopefully I’ll catch a concert there soon.